Microsoft has discontinued both Forefront TMG and UAG, and you're left searching for alternatives. But there's good news: we make finding a new solution easy with our TMG Replacement Guide. Our guide helps you evaluate prospective alternatives and describes how you can turn an annoying replacement project into an upgrade. Look at replacing TMG as an opportunity, not a pain. Now's your chance to replace your old Microsoft TMG with simpler, better protection. Sophos UTM is everything you need in one virtual box - you can even use your existing Windows Server if you want. Most importantly, it's a solution that makes threat management simple - and it's even easier to grow your protection over time. So TMG, thanks for the memories, enjoy retirement. Threat Management just got a lot better with Sophos UTM. 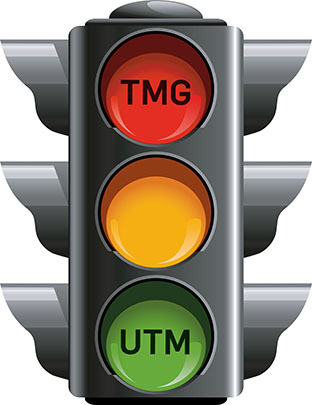 UTM Accelerated is loaded with over 60 major new features across all areas of the UTM - including new features we added at the request of Microsoft TMG partners and customers. We've added reverse proxy authentication profiles with basic and form-based authentication options for protecting Outlook Web Access. Plus, we updated the web application firewall engine, and so much more. Learn about new features and our beta program on the Sophos Blog. "Many products claim to be the best choice, but don't have all of the functionality of TMG. 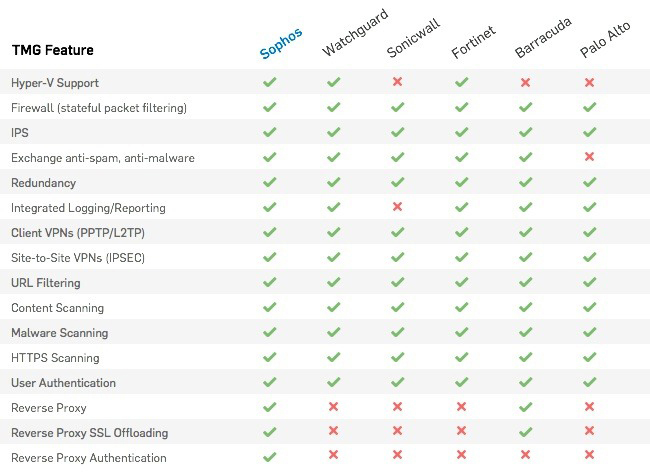 Sophos Unified Threat Management is different. Sophos UTM combines a firewall with anti-malware, VPN, anti-spam, IPS, forward and reverse proxying with authentication and more." "The layout of the Sophos UTM firewall interface is sufficiently similar to that of TMG so that you won't feel as if you've gone through the looking glass into a whole new world." "Sophos UTM is one of the most comprehensive products we've tested over the course of this series and I think it will be a suitable TMG replacement for most environments." "Sophos UTM does not only replace TMG but also brings a number of new benefits that will help improve your businesses security." This guide will help UTM administrators with a TMG background migrate to Sophos UTM. It highlights major similarities and differences between the products, and is designed to help you get comfortable with the extensive functionality in Sophos UTM. Check out the webcast we held with Fastvue and see why replacing your Forefront TMG solution with Sophos UTM is your opportunity to experience the best in network security, reporting, and analysis.